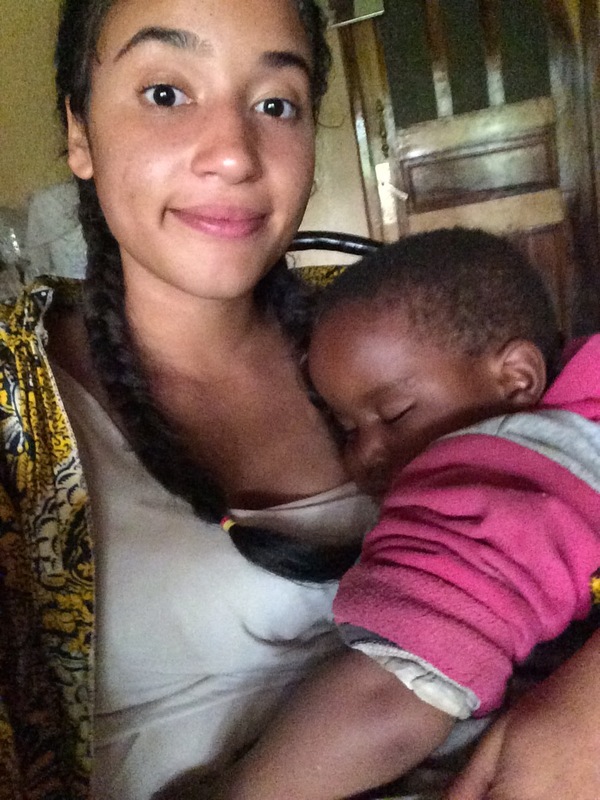 Just a Florida girl stoked to be Jesus' hands and feet volunteering in Tanzania. “Pole pole!” (pronounced pole-ayy pole-ayy). If I had a dollar for every time I was told that over the course of 2 days I think I’d have enough money to eat out at a restaurant here every night for two weeks! 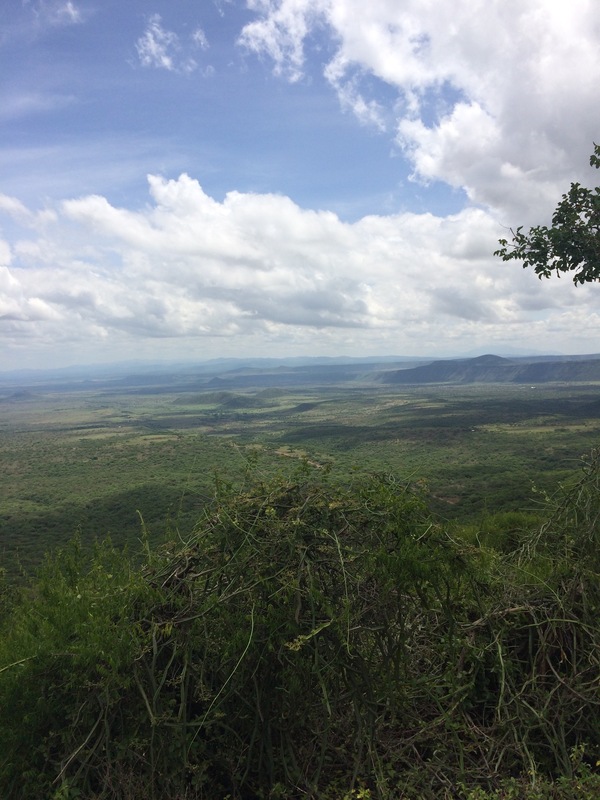 But I’m getting ahead of myself, so let me back up and take it from the top, from the very start of my journey to spend a weekend with the Maasai. Location: Arushatown Supermarket. So I was traveling with a guide who was a friend of my host family to Monduli, which is about a 3 hour drive away from where I live, so we had decided to stop at a supermarket to stock up on some snacks for the drive. Now let me clarify… Most stores labeled as Supermarkets here are little more than the size of 7/11 convenience shops, many even smaller than that. So when I heard we were going to a super market to grab some snacks- a tiny store perhaps made of aluminum sheets was what my mind was prepared for. Well I was like a kid in a candy shop looking all around in awe when we arrived. I walked through head swiveling, marveling at the long aisles, bright lighting, and even a produce section just like the in the US AND a bakery. I think my mouth was literally gaping open when I saw conveyor belt checkout lines instead of getting your change from someone’s waistband. I would have been happy to spend an hour simply drifting down the aisles just looking at everything. After a month of only buying goods in open air markets( not complaining LOVE the markets) where your fruit lays on tarps, the cement floor or in straw baskets, I truly experienced a culture shock of a second kind going into a super market today that likened to Publix! I was cracking myself up because it was truly as if I had never been inside a grocery store before. I was like Briana you’ve only been away a month! But hey as the quote goes “if you can laugh at yourself then you’ll never cease to be amused.” TRUE. Now here’s a little fact about me: I love donkeys! 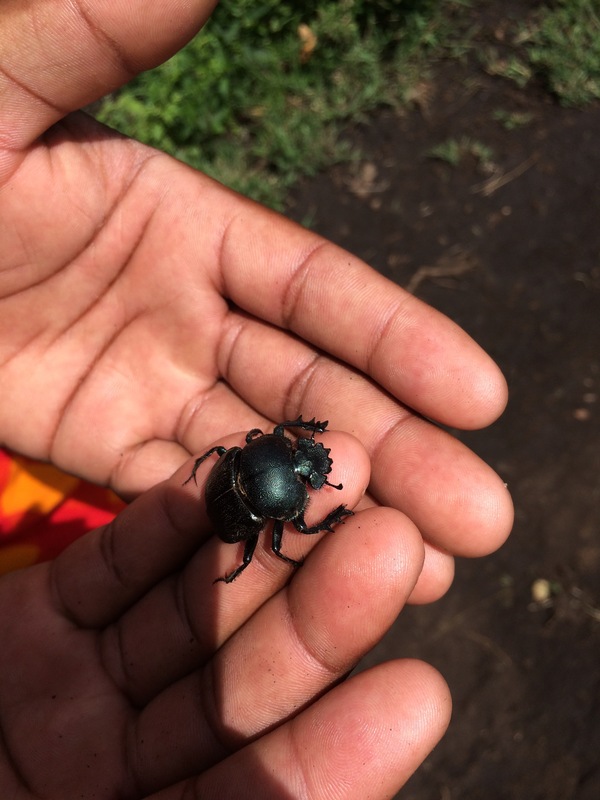 I think they’re so cute and lucky me here in Arusha they’re abundant. And the people think I’m crazy for thinking donkeys are so cute when to them, they’re just a work animal. I remember driving from the airport and asking my driver if he could stop for me to take a picture with a donkey we saw on the side of the road, and he just looked at me like I was crazy .. “picture with a punda( Swahili for donkey)? !” And then he ignored me and just pressed the pedal a little harder, ha probably thinking let me get this crazy American out of my car! 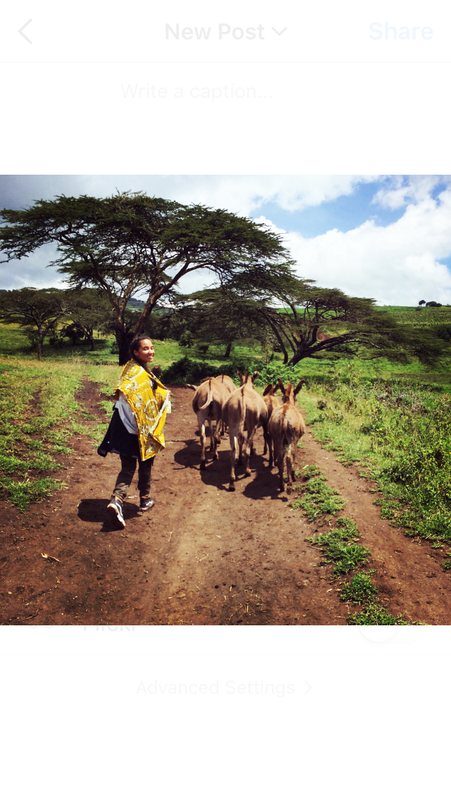 So anyways when I heard that you could visit a Maasai village using a donkey as transport I was so excited! So I quickly booked the trip and that brings us to where we are now in this story. So after grabbing snacks, it was time for the long drive. I passed the United Nations courts where the Rawanda trials were held, and passed fields where camels were grazing. Imagine, passing a field of camels! Now that, was cool. 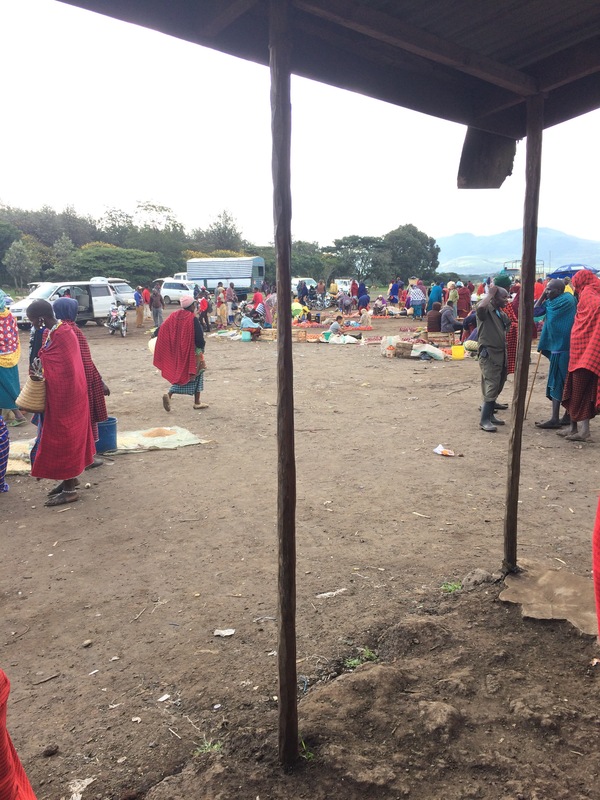 The Maasai tribe has been pushed further and further back as gentrification has occurred and to get to this particular base we had to enter military territory. My guide had once been a member of the military and so with pride I was shown the various buildings and training grounds. The car snaked up up the mountain, with one incline turning into another, and of course as always my Florida ears were popping from the elevation. Gazing out my window the scenery turned into dense rainforest, and if you swerved off the road- safe to say that would be a long drop to the bottom. The lush landscape was a vibrant green, with various types of trees popping out the mountain face. We could see the tracks and telltale slide marks of elephants struggling up the slippery mountains and that was insane to know elephants were right near where we were. Fresh dung piles told us we had just missed a sighting of them, which was disappointing but even seeing the massive footprints was enough of a thrill for me. We finally arrived at a house and I met my Maasai guide for the weekend, Lanuni. Here came lesson number one in going with the flow: there were no donkeys for me to ride. Safe to say I. Was. Ticked. I mean this was the whole point of the trip! And I had been so so excited to ride a donkey. I was told “rideable” donkeys had been switched to a different pastureland. HOWEVER, it was truly a weekend of a lifetime and I probably would have missed out on a lot had I been confined to the back of a donkey. Things happen for a reason. Rapid fire came the next lesson: trust. 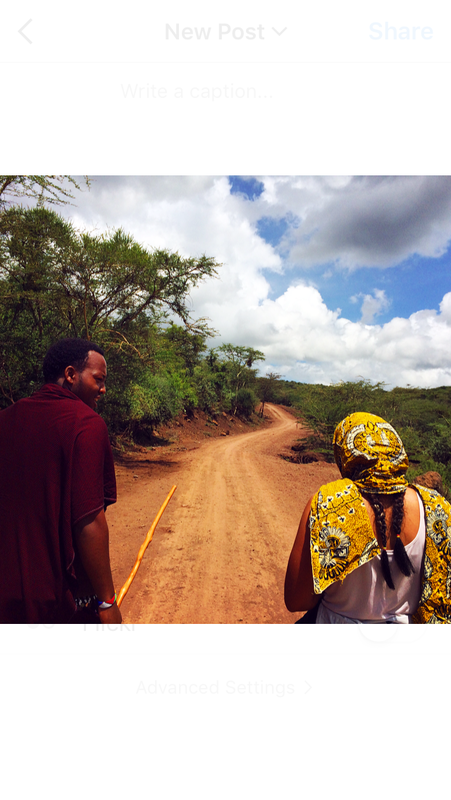 My guide from Arusha drove my Maasai guide and I down a road and promptly dropped us off to start our hike. Here I was in the middle of nowhere with a guide I didn’t know. But as we walked on the red soil path different village dwellings, giraffe tracks, and plants were pointed out to me and I got to know him, he was a great guy and guide. He also made sure to stop anyone walking by with donkeys in order for me to get a picture with them. Even as my enthusiasm about pundas wore off throughout the weekend he never failed to excitedly point out “pundas!” whenever any were near. Within 20 minutes my other guide had caught up with us- turns out he was just parking the car and also had known this guide and his family for years and had been bringing tourists to them for quite some time. 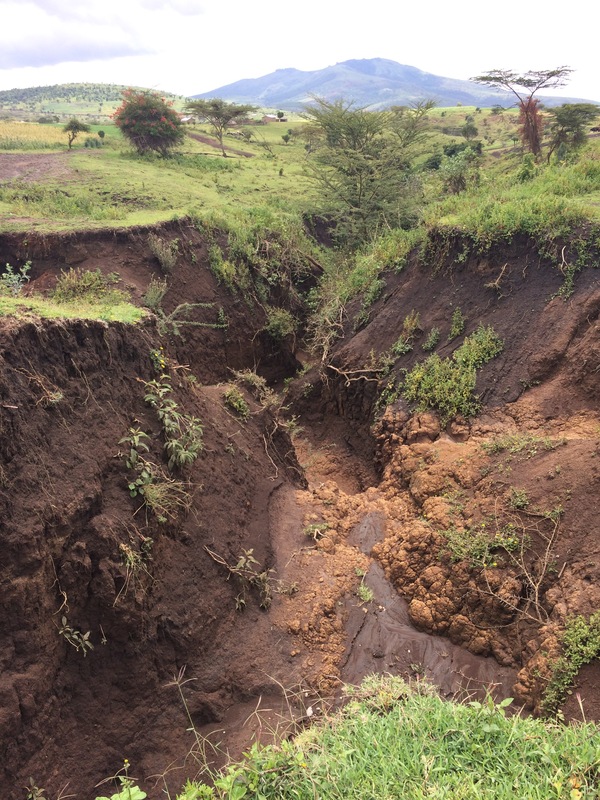 Stopping on the side of the path, I got an amazing view of the East African Rift System- an active continental rift zone that it one of the most extensive rifts on the planet. It was incredible and definitely made you feel a lot smaller in the world. Looking down I could see compounds made up of 8 or so huts. 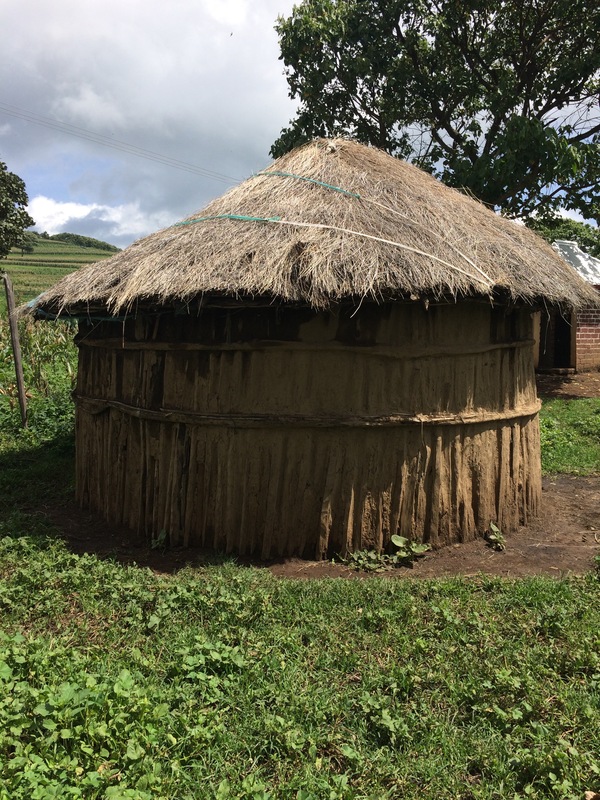 I learned that the materials for the hut are collected by the men and the huts are constructed by the women. 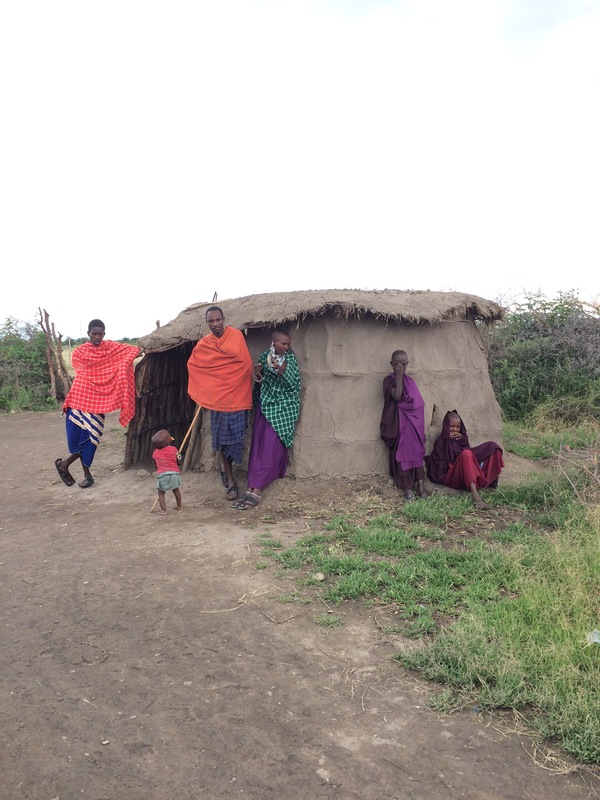 In Maasai communities women really have a large share of the work- child rearing, cooking, cleaning, fetching water, gardening…..
Once the hut is complete, dung and mud are plastered on the walls and roof of the structure and a fire is started inside to dry and cure it. This creates a waterproof hut that is cold in the hot months and insulated and warm in the cold months! This is another reason the Maasai can be a nomadic tribe- homes can be easily constructed again in a new place and the material comes straight from the earth- in fact almost everything they need in general comes right from the earth. There is no electricity, so cold food is not an option. Imagine- no cold water on a hot day, no cold milk, and definitely no ice cream. Every now and then we’d have to hop to the side of the road to get out of the way of a piki piki- motorcycle used to transport people- as it made its way up/ down the hill. Piki pikis are really common in Arusha and you can often see up to 3 people on the back of a piki piki or an entire family- dad mom and 1 month-old infant plus the driver!!! All on the back of the motorcycle clipping along at a really fast pace down the highway. Here in Monduli the piki pikis have only been around about 5 years and the majority of Maasai there still only use walking as transport and don’t trust the piki pikis to make it up the hills. Funny because at times I didn’t believe in my legs’ ability to get me up the hill! 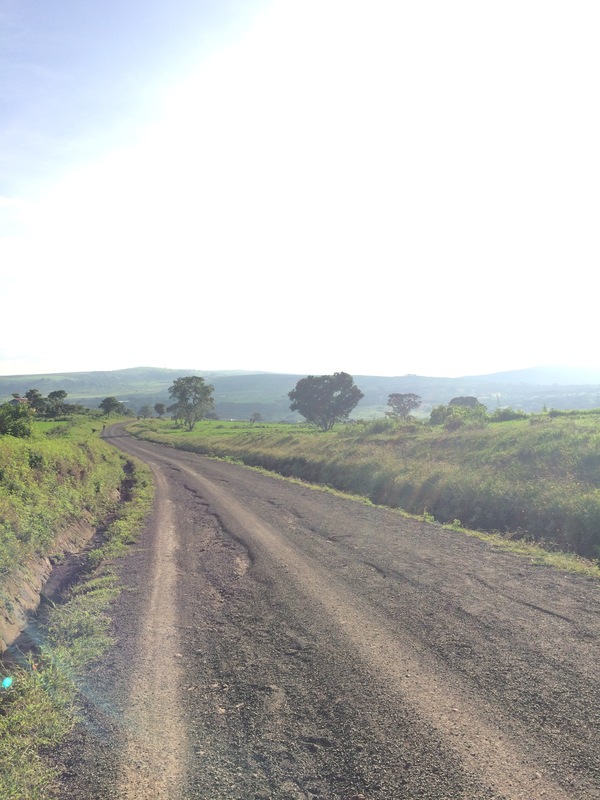 Which brings me to my next adventure with the Maasai- ohhhh the walking. So after walking awhile to enjoy the views of the valley, my guide got in his car and drove away again, leaving us to walk back home. Turns out it was all part of the experience tho and perhaps one of my favorite memories from the whole weekend! Simply to walk home from where we were took almost two hours! (Way less time by car) But it was incredible to walk through lush green fields, valleys and pasturelands, waving at all the children with their herds. Sometimes the earth rose up on either sides of us, other times it broke apart leaving deep rifts in the earth. Our feet carried us past flock after flock of cows, sheep, and goats -most tended by children under 10 and some flocks under the supervision of children as young as 4 years old! Crazy juxtaposition to how we baby young children in the USA and here they are out in the wild with full responsibility over a flock of animals and they are both thriving and surviving! It was incredible to see a way of life so preserved and upheld, and I can’t quite describe what it was like walking through the lands and through the various dwellings but it was just out of this world and SO different from any life back home. Here most parents don’t like their children to go to school, mostly because they feel it threatens their way of life as the children can tend to want to move on from the culture sometimes. Before visiting I would have thought “That’s so bad , how can they keep kids from school?” But after visiting I can at least understand the intense desire to want to preserve your way of life, and the Maasai life is not a bad one, often free of technology, living off the land and truly enjoying moments with family and friends and just living life as it comes, following the rhythms of the earth. Not that I support wanting to keep them from education but I think this is what travel is all about, learning more about others so even if you don’t agree, perhaps you can understand where someone is coming from , and not just judge harshly from across the globe. He would smile and just say “Ok, pole pole” which means slowly, slowly in Swahili. This was probably about the 5th time I’d heard pole pole by now. At one particularly wide fissure though I had to admit my jumping inadequacy, as the *logical strong woman* in me reminded myself of the lack of ambulances in the region, and how would anyone ever get to us to help me, as breaking a leg was inevitable if I took the jump. LOL. Needless to say we moved further down till we found a smaller gap to hop over. When we finally reached home , sitting down at the table to eat I learned more about the customs of the Maasai. (Disclaimer: these were the customs where I was, I don’t have enough Maasai knowledge to claim them for all Maasai, simply the Maasai in the region I stayed.) First off, men and women don’t eat meals together. Even from the age of 2, a young boy will no longer sit to eat with his mother. *Being non-Maasai I was exempt from that rule and my guide could eat with me. * Women are not allowed to cook meat for men, and any meat touched by a woman will not be eaten by a man. Additionally the only meat a women can eat is the stomach or small intensifies. Special exemptions are made after childbirth when a woman is made a special soup containing meat and also given animal blood. A woman cannot even look at a man while he is eating meat! If having a conversation with him while he is eating, she needs to turn the other way and avert her gaze. Since our meal was vegetarian that issue did not come up. Some other traditions I found very interesting is that after childbirth the father will not see his child for the first time until after perhaps 2-3 months! Additionally husband and wife have separate beds. After a meal and some quick bonding time with the lil one of the house- a 2 year old member of the family named GoodLuck who fell asleep on me following lunch – it was time to hit the market. Aka time to start the 45 minute walk across fields and down the hill to market. I think my shopping habit would be nixed in the US if I had to walk 45 mins to the shopping district, that’s for sure. At the market was the usual fabric and produce with the addition of a stretch of grassy area that was specifically for selling livestock. And of course the area where meat was butchered and sold was male only. All around me people were adorned in garments creating a swirl of traditional Maasai plaid patterns all around me in reds, blues, and greens. Many women had silver earrings that attached to multiple holes in the ears and in some cases the nose. 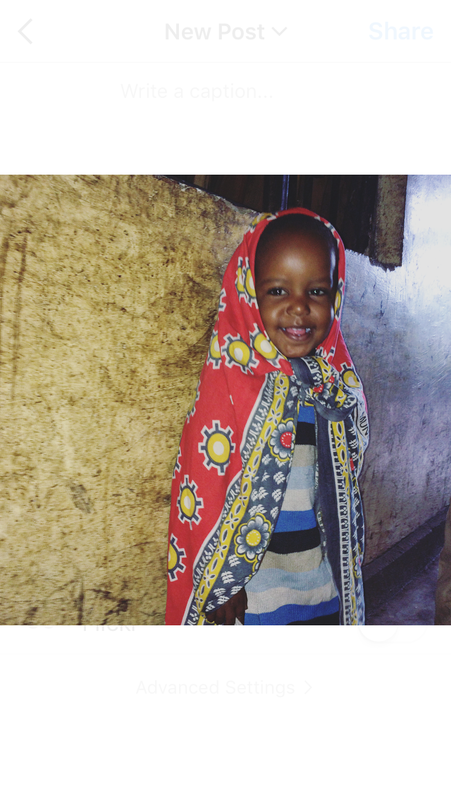 The Maasai are a striking people- typically tall and skinny- and I saw many beautiful faces. One older woman was so beautiful, with her face framed by hundreds of white beads attached to earrings that looped and hung in a scalloped formation and hundreds more beads wrapped around her neck. She had two scarification marks under her eyes on her cheeks, in the shapes of moons, and I learned that these are given at a young age with the belief that they prevent disease in the eye, although not all families participate in the practice. I couldn’t help but have my guide ask her if I could take a picture of her, but some Maasai are very shy about photos and she refused. I wish you could have seen her. 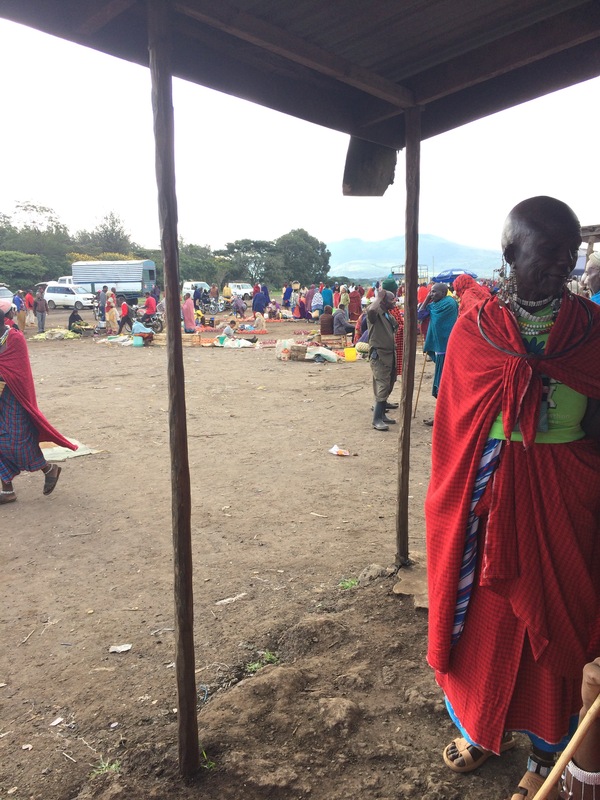 The hustle and bustle of the market was in full swing, and I didn’t stand out as much as I thought I would even though I was the only non-Maasai that I saw. Usually in Arusha, I get a lot of stares as I look different, but here the Maasai didn’t seem much bothered by me at all. I was wearing a colorful head scarf that day, and apparently some just thought I was African and even asked the guide if I was his wife! Ha. One thing that was very interesting was hearing another different language. 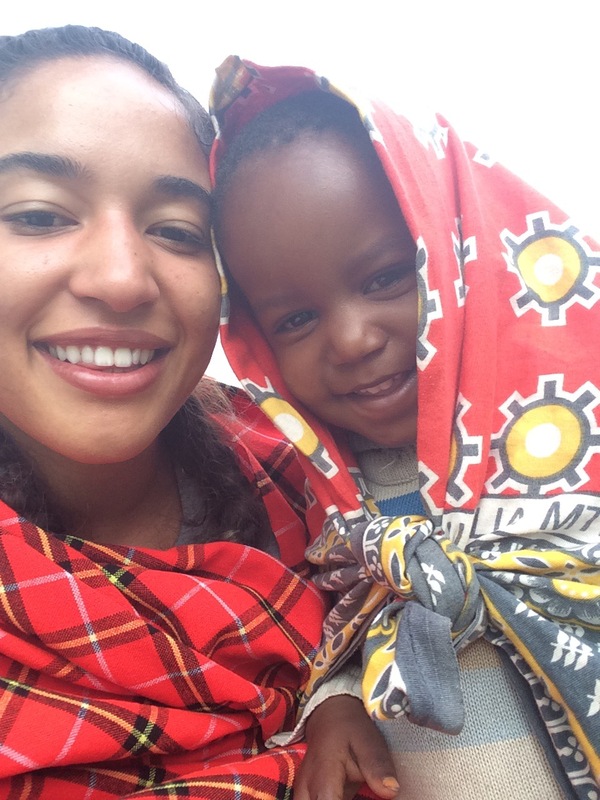 Here I was barely getting the hang of Swahili and now I had to learn new greetings in the Maasai tongue! “Yeyu tequena” to ladies and “So-pie” to men to which the response is “Iko” and “Heypa” respectively. By the way spelled those phonetically, not sure of the real spelling. When we arrived back home what a sight it was to see the yard slowly begin to fill with animals as various memebers of the family returned with herds/flocks. The boy tending the goats was about 8 years old and when he saw how I was obsessing over a young lamb, he shyly brought over a 3 day old goat they’d been keeping in the house. 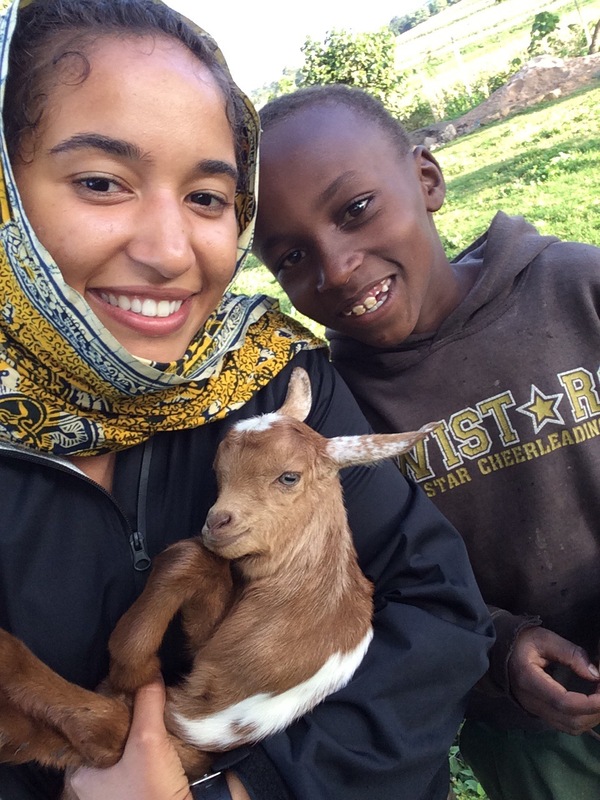 Well if Tanzanians thought I was weird for loving animals before, they probably just officially accepted I must be off my rocker as I cuddled and held that little goat for 30 minutes. It was so cute when I put the goat down, it bleat once, and instantly it’s mother respond from the other side of the yard and rapidly made her way over. The mother child connection, whether it be animal or human, is one that is unbreakable. 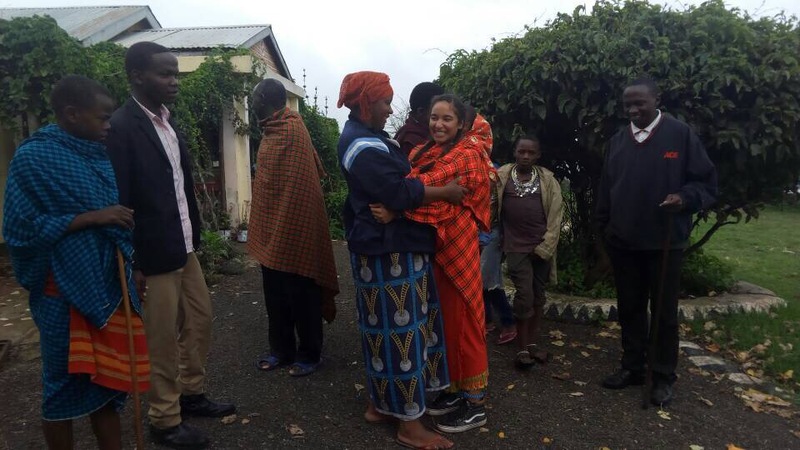 Although the Maasai family I stayed with was one of the few families with a Western house, there was still no electricity there. So to charge my phone ( I wanted to be able to take pics in the morning) it required a trip back down to the market to find a dukka (small stall type store) that had electricity. Luckily this time we took the car! Again came a lesson in trust that went against all travel guidebooks, as I handed my Maasai guide my phone and charger and watched him walk past the rows of dark stores to one about a mile off, one of the only dukkas illuminated in the dark of night by one lone light bulb. Next a woman came to my car window selling chai (tea) and sweet treats. I had seen the state of the store they came from and could only imagine the kitchen area and at that point also knew that much of the water in the area was gathered from a not-so-clear lake where wild animals such as elephants and cows also bent to drink. So that was probably what my plastic teacup had been washed in. And by this point I had also seen the cow milking process and knew there was no antibacterial or pasteurization process whatsoever. But I thought what the heck why not… if my stomach isn’t made of steel by now, oh welll. I made the right choice. The milk chai was AMAZING, and I typically don’t like anything with dairy in it, but it tasted like an exotic hot cocoa, and as we were high in the mountains it was the perfect antidote to the chill that descended into the region as the sun faded out of sight. And I may have had to pick off a bug off of my Mandazi ( popular African fried biscuit) but it was the most delicious pairing for the creamy chai tea. And as I alternated *bite, sip, bite, sip* I leaned my head against the car window and looked up at the night sky and it literally took my breath away. With only a few dukkas with electricity, there were no bright lights to impede the view of the stars, and my goodness , were the stars putting on a show that night. I don’t think I’ve ever seen that many stars, soft twinkling lights peppering the black sky, and it almost seemed as if I could see the hazy nebulas of constellations. I think I stayed gazing up at the sky with my face pressed against the glass for upwards of an hour, I was literally mesmerized. It was as if I was in a drive-in movie, but instead of soda and a popcorn I had chai and mandazi and instead of a movie I had something better, a sky painted by God himself and in that moment it felt like it was just for me. My advice to any travelers: drink the chai, eat the mandazi, and take a minute… or hour for the stars. For me, it was one of my top 5 moments of my life. One hour later Lanuni went to go retrieve my phone from the shop and soon it was back safe and sound in my hands( not gonna lie , breathed a big sigh of relief when I had it back). The next morning after breakfast we said goodbye to Lanuni and his family ( who were so so kind and welcoming and who my parents will get to visit and meet when they come to visit in June). We then went to another Maasai village about two hours away, that especially welcomes tourists and performs traditional tribal dances. There I learned polygamy is very common among the Maasai and one man told me his father had 10 wives! My last lesson to go with the flow came as we stopped at a lodge for a “brief” check-in for my guide to inspect the facilities. I’ve learned “African time” since I’ve been here, but after 2 hours I was getting antsy ( okay I’ll admit antsy with a side of annoyed). When I moved to a couch to nap, my guide sent me on a tour of the grounds with one of the workers. Well that turned out to be amazing. Brightly colored lovebirds flitted about in the sky and I quickly counted my blessings not my annoyances. 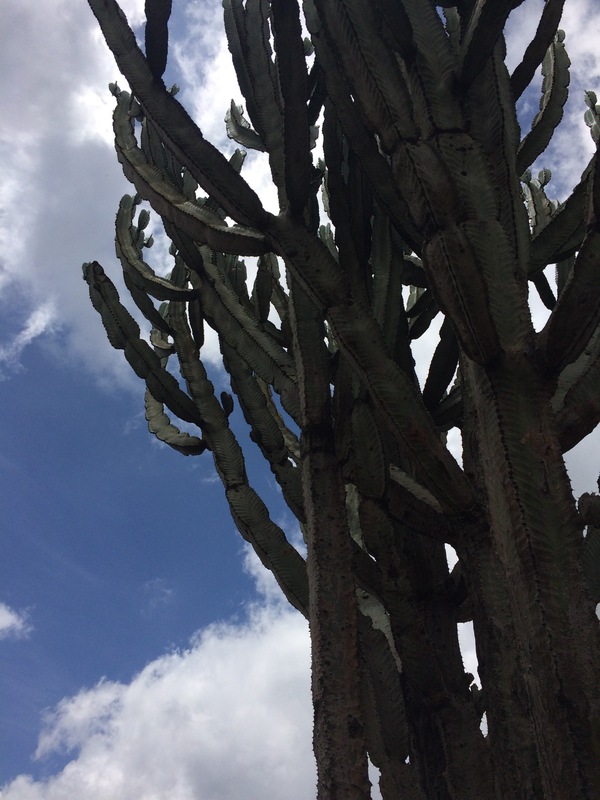 I was in a national park and on a personal walking tour to Lake Manyara getting a Swahili lesson along the way, and was literally feet away from wildebeests, antelopes, and gazelle in their natural habitat. My own personal safari without the confines of a vehicle. As we neared the shore of the lake, hundreds of pink flamingos rose out of the water and took to the sky, startled by our presence. 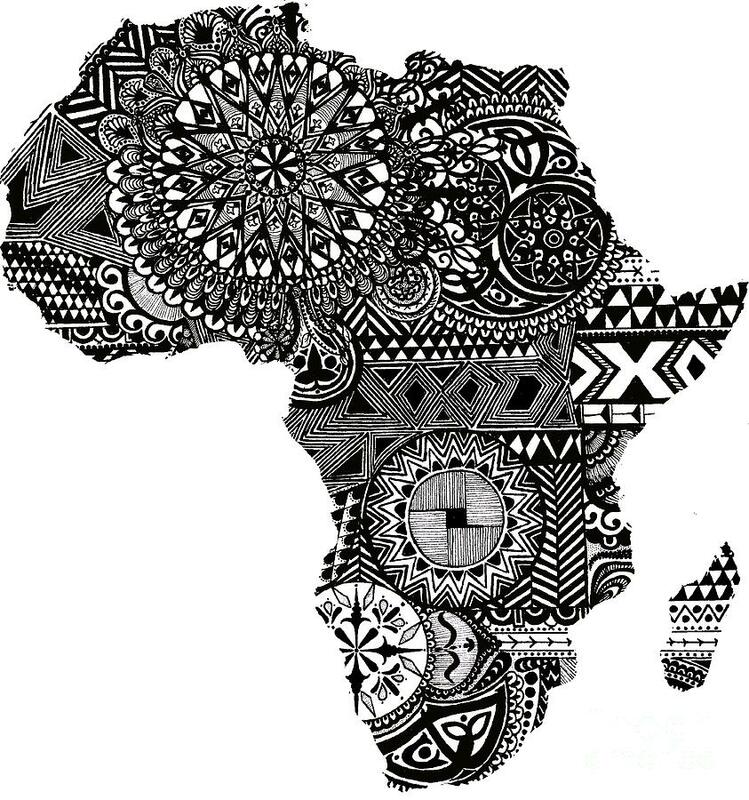 That was an unreal moment as I had seen that scene be the start of many National Geographic, Planet Earth, and Animal Planet TV series on Africa. It was wild to be seeing that “movie scene” play out in real life before my eyes. It was also unreal to be walking where lions could be just off in the trees, but the worker walking with me informed me that as long as the other animals seemed unalarmed and remained far from the lodge, all was well. He said that if the staff wakes up in the morning and the animals are crowded near to the lodge they know, “Oh no, a lion is near.” And quickly dash on full alert between buildings to make it to their jobs and start their shift. This trip was quite a 2 days! I learned much about trust and going with the flow. If I’d remained annoyed at the fact there were no donkeys to ride, I could have missed out on an amazing experience, amazing people, an amazing culture, and an unbelievable sky. 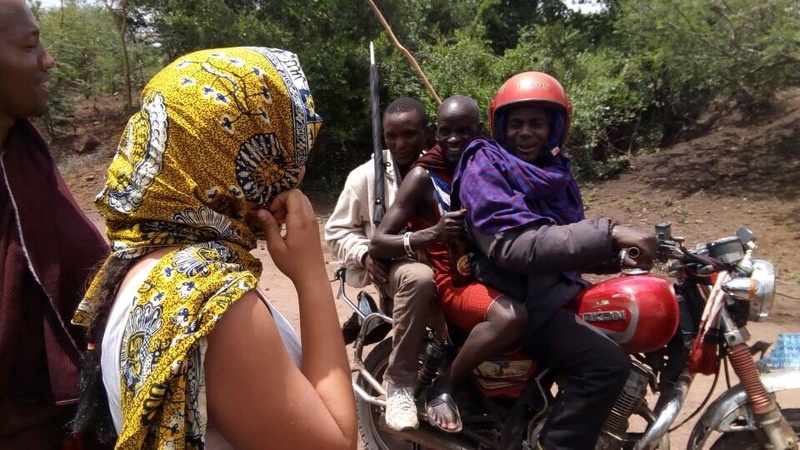 If we hadn’t spent an extended time at the lodge the next day I wouldn’t have gotten to walk the shores of Lake Manyara in the company of gazelles and meet a kind worker who ended up setting up the safari trip for my family in June at a steal of a deal! The Maasai culture is fascinating in that even in the face of modern times, it does not fade away or conform. 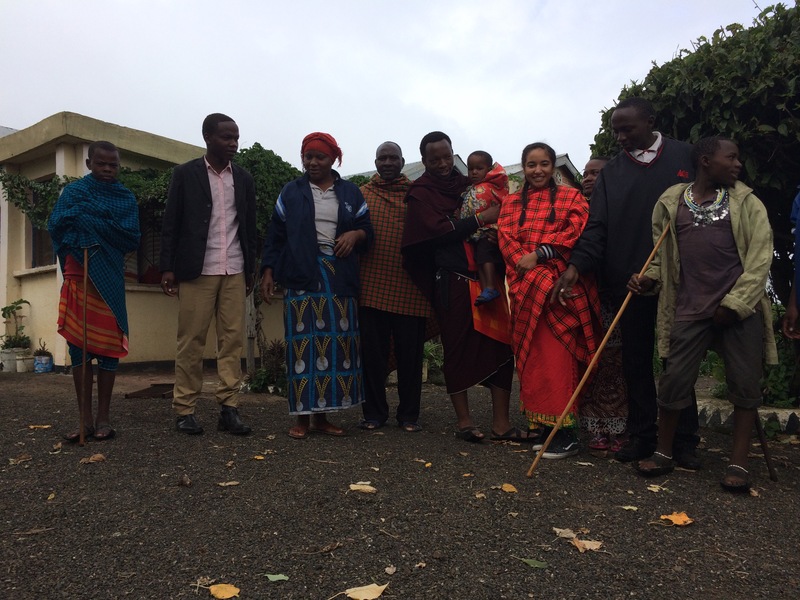 In Arusha city you see tons of Maasai, all aware of what city life and garb is, but still wearing their traditional cloaks of plaid fabric, their interesting sandals, and many carrying a tall walking stick. 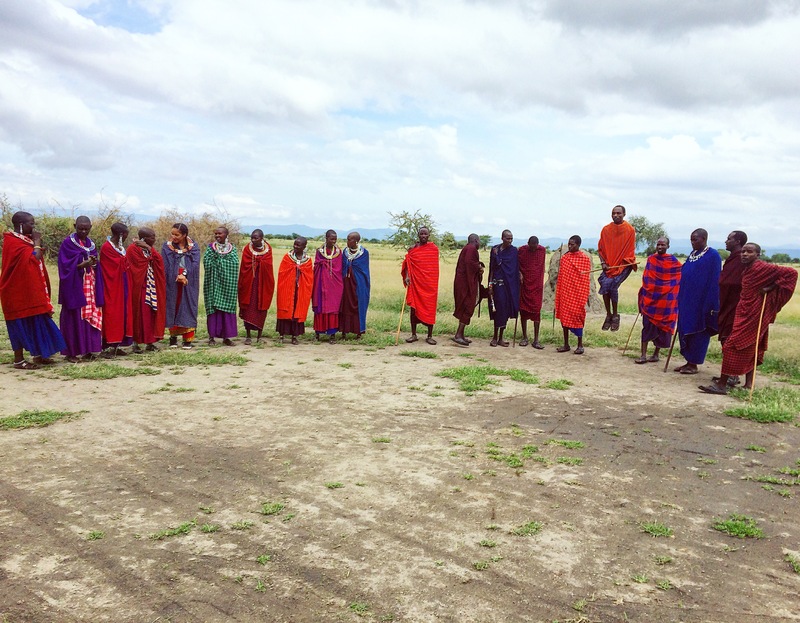 The Maasai culture will prevail because it is ingrained in its people, it is a source of pride, and because it’s people seem to usually want to return to their roots even if they stray away. 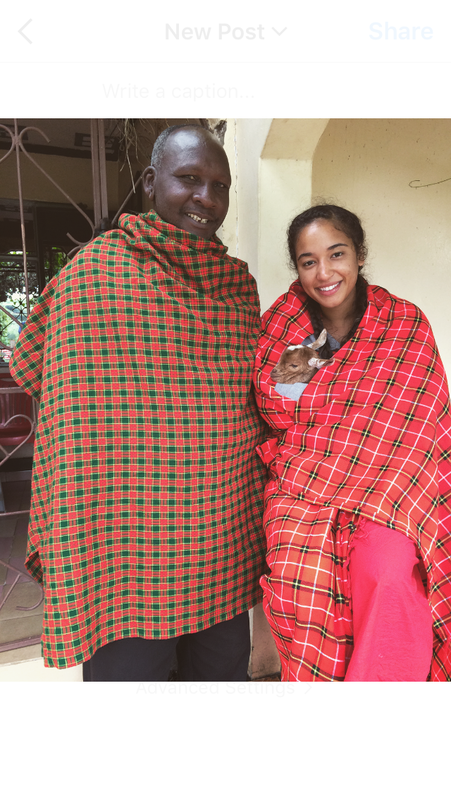 A random small world moment occurred when I made it back to the orphanage that week where one of the guards is Maasai and I told him where I was that weekend. Turns out that he is from that village! And even could name the family members I stayed with by name when I showed him the pictures from my trip. Andddd turns out he has 2 wives! It really is more common than you might think. Well sorry it took so long for me to write a blog but I’m in a writing mood now and there’s much to say because God has been working so much during my time here! I really feel so settled in here now, I know my way around, and this week when I went to market I ran into so many people I knew, that it really is starting to feel like a home of sorts here for sure. So stay turned for a blog within the week on all that’s been going on. 🙂 As always thanks to everyone who has been praying for me. What we hold in our hearts is what we pour out into our lives and what spills over into the people around us. It’s always good to take an inside look and see what we’ve got going on in there- love, jealousy, envy, anger, pain, joy, heartbreak, happiness, confusion? Whatever it be that you find, my best advice is to give that heart to Jesus and He’ll fill it with the good and help sort out the bad. And whatever your religious belief or if you have none at all, it’s never a bad idea to do a little personal X-Ray and examine what we’re holding dear to us in our hearts, and what negative things in there we’ve been letting take up residence that we need to get rid of. Cuz remember, real estate in the heart ain’t cheap and it’s a shame we let bad things stay for free and take up space where so many good things could live. Can you spot me ? The man jumping- one of the traditional dances involves jumping and is done when men are fighting over a woman for a wife. Jump higher- you win!